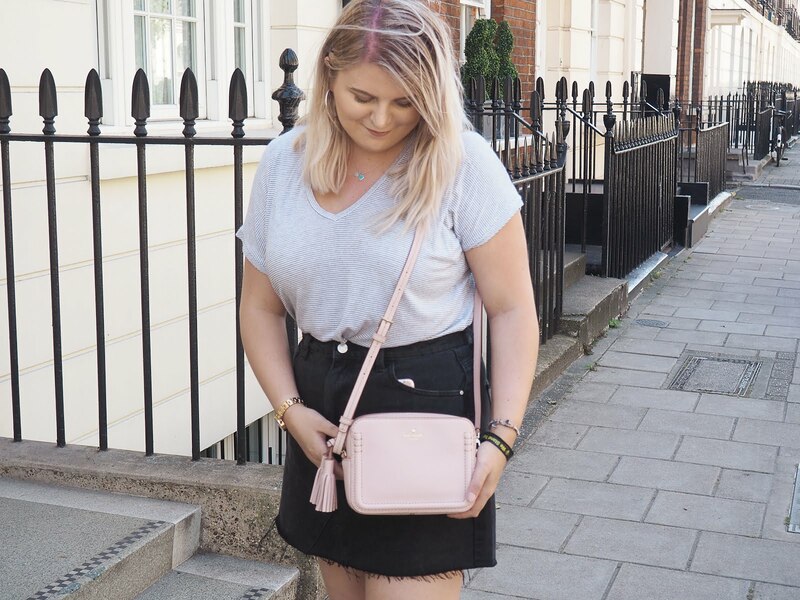 Apologies for not posting on Wednesday, life and my UCAS application got in the way but now that's all done and dusted, I want to put more effort into my blog than ever! This review may come as a bit surprising as I've never really touched on weight loss on Chapters of Kat before, but it's always good to try something new, right? 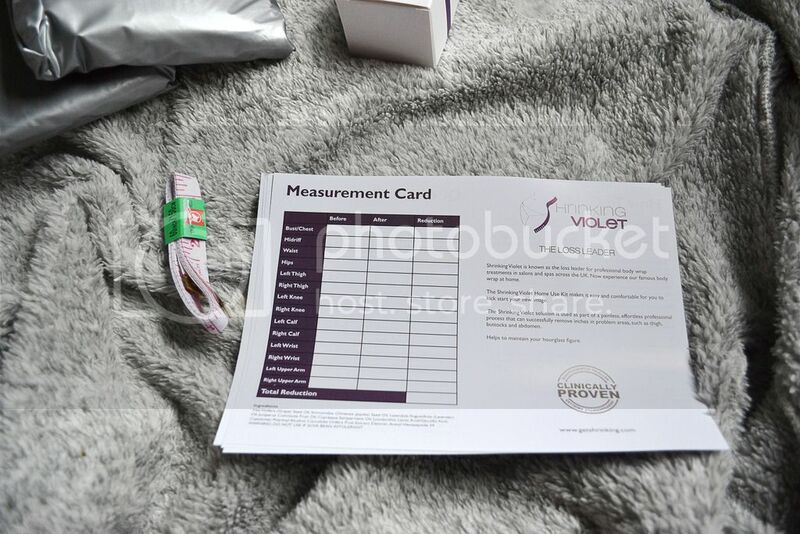 When I was first contacted by Shrinking Violet, I wasn't really sure what to expect but after having a quick Google I began to understand the concept behind the product and wanted to give it a go. Anything for the blog. After a few issues with the delivery, I eventually received the kit I was going to be testing out. You're probably thinking, "what is it you're actually reviewing?" Well, it's a body wrap! How does it work? 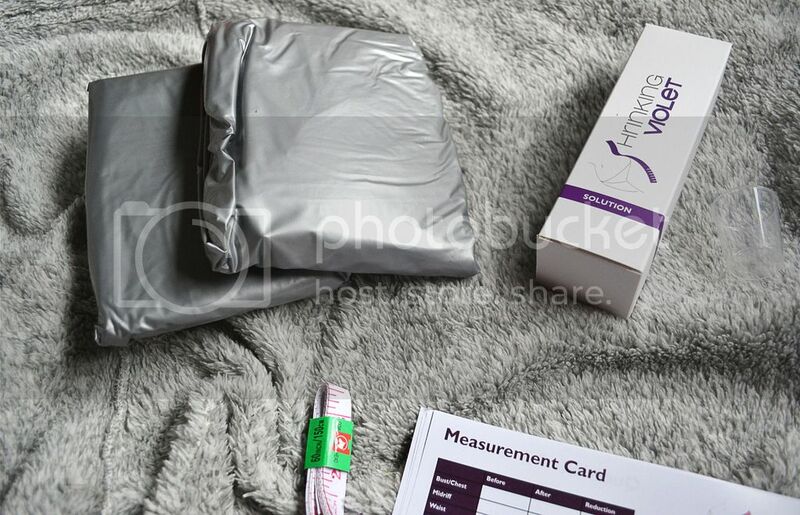 The kit includes a 'Shrinky Suit', tape measure, measuring cup, 'Shrinking Violet solution' (oil) and record cards. The aim of the product is to apply the oil to any problem areas, so the areas you would like to lose a few inches on, before putting the suit on. I must admit, the suit got a fair few laughs from friends. The only way I can describe it is that I felt like a cross between an astronaut and a turkey all wrapped up ready to be cooked. It was one of the most unusual things I've worn to say the least. The suit increases your body temperature which essentially sweats out all the toxins, therefore resulting in weight loss. I noticed that I had warmed up but it wasn't anything uncomfortable. It's worth noting that itchiness may occur also, but again, it wasn't uncomfortable. Initially, I was a bit grossed out at the fact you can't shower for 12 hours after wearing it, so thank god it wasn't absolutely boiling. The oil didn't leave me feeling greasy for hours after either which I was very thankful for. It also smelt lovely, very crucial! Did it work? Surprisingly, yes! After my first try, I lost 3.25 inches overall. Pretty impressive. Obviously it wasn't very noticeable to me personally so I wouldn't resort to it as the answer to weight loss but considering all I had to do was sit there for an hour, I can't complain. I'm not sure exactly how it works as I had gained inches in some areas but that could just be down to incorrect measuring. Have you tried/would you try something like this? There are so many ways to lose weight and get into shape these days. What happened to good old exercise? Ha! It'll be interesting to hear how you find this product - keep us posted. Yep, there's always something new isn't there? Thank you! I am definitely intrigued by this! I want to know how it works! I've never heard of anything like this before! i always think things like this are used as a 'quick fix' great review! I agree! I'm wondering how it would work for someone who has a super healthy lifestyle. I think it's something about water weight and losing that through the sweating? Always just thought they were to lose a couple of inches for an occasion or something as the results don't last long do they? Interesting to see how it worked for you!